I’ve been beekeeping for about 10 years and I’d still consider myself a beginner. One of our suppliers has been a beekeeper for about 40 years and he says he’s still learning new things. It’s not for everyone, but once you get hooked on beekeeping it can provide an endless source of learning and discovery. Bees are, after all, the most studied insect on the planet and there are countless books and articles on their remarkable social behaviour to pour over. 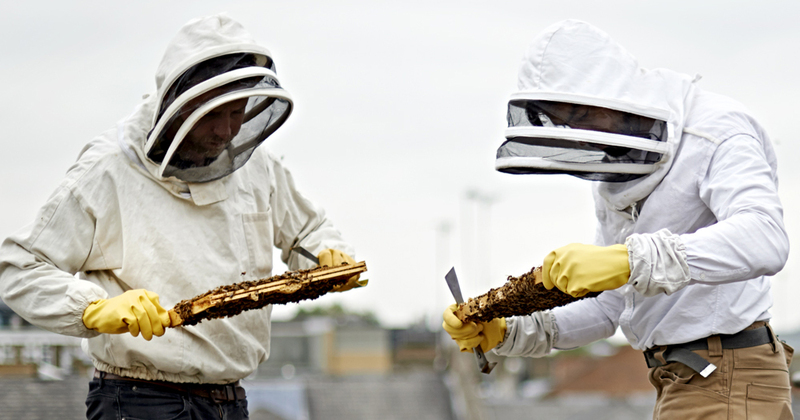 I first got into beekeeping after attending a course hosted by a local association. It’s a great way to start and get an introduction to the ups (and the odd down) of being a beekeeper. Joining an association gives you the opportunity to meet other like minded people and opens up a world of knowledge that established beekeepers are only too willing to share. Believe me, it’s very handy to have an experienced friend on call to explain what’s happening when the bees are doing something odd or if they’ve swarmed up a tree and you need a hand to hold the ladder! As a rule of thumb you only open the hive when it's 15 degrees or more so you’ll seldom be doing anything bee related in the rain, wind or cold. There’s little better than being outside on a lovely warm day exploring the wonders of a colony and hearing the soothing hum of the bees flitting about. Working with bees has the ability to be extremely calming, almost magical. It can feel rather meditative, melting away any day-to-day stresses that you might have in your life. For me, this connection with nature is the best part about beekeeping. In fact more and more studies are revealing the benefits of the natural world on our mental health. There’s also the sense of achievement you get from nurturing a small colony into a strong productive hive. You have to learn to work in tandem with the seasons and the bees, becoming attuned to both their cycles. The main beekeeping season occurs during the fair-weather months of April-September, leaving time to reflect, rest and plan for the season ahead during autumn and winter. Last but not least there’s the satisfaction of producing your own honey. In some years yields may not be huge (normally down to the good old British weather!) but in other years you might harvest 50kg from a single colony. And there’s the other products from the hive - bee pollen, beeswax and propolis - all with their own unique properties. These are just a few benefits of keeping honeybees. It truly is a humbling and educational experience that has the ability to reward you for life.